Mozilla Firefox is the second most popular web browser in the world, behind Internet Explorer; like Windows, IE is made by Microsoft, and is by default installed on every new computer that comes with this operating system pre-installed. In order to use Firefox, you will first need to download it: the download is free, quick, and easy, as you'll learn in this tutorial; in the next tutorial, we will explain how to install Firefox on your PC (computer running Windows 7, Windows Vista, or Windows XP). First, open a new browser window and go to www.firefox.com (you can click on that link, and you'll land on the official Firefox download page). If you go to that page, you will see a table of download links for each supported language, and a download link for Windows, Mac OS X, and Linux. But, as mentioned earlier, you will generally just need to click on the "Free Download" button to get the correct version of Firefox. So, click on the big download button, and a download dialog will appear, which lets you choose between saving the Firefox installer file on your computer, or run it from its current location. 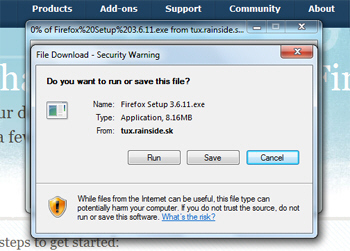 Especially since this is a small download (less than 10 megabytes), we'll choose to "Run" instead of "Save" - by choosing this option, Windows will automatically put the downloaded file inside a temporary folder, and will delete it later on; this saves you from having to manually delete the Firefox installer once you have successfully installed it on your PC. The download will start either way, and if you chose Run, Windows 7 / Vista / XP will present you with a final "Run / Don't Run" dialog. The next tutorial will now take over, and explain how to install Firefox on Windows computers, which goes in details into the options you can configure during installation.